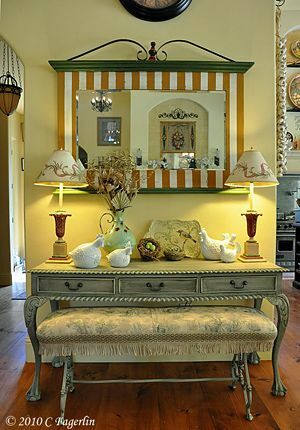 and Tangerine, with touches of other green things thrown into the mix. from Target, cutwork bowl and plates from Home Goods. 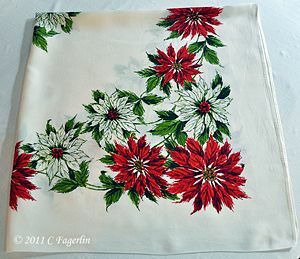 Here's a sample, follow the link for more pictures. More pictures if you follow the link. Are you ready to party? Follow the link for more pictures. So colorful, Candy! 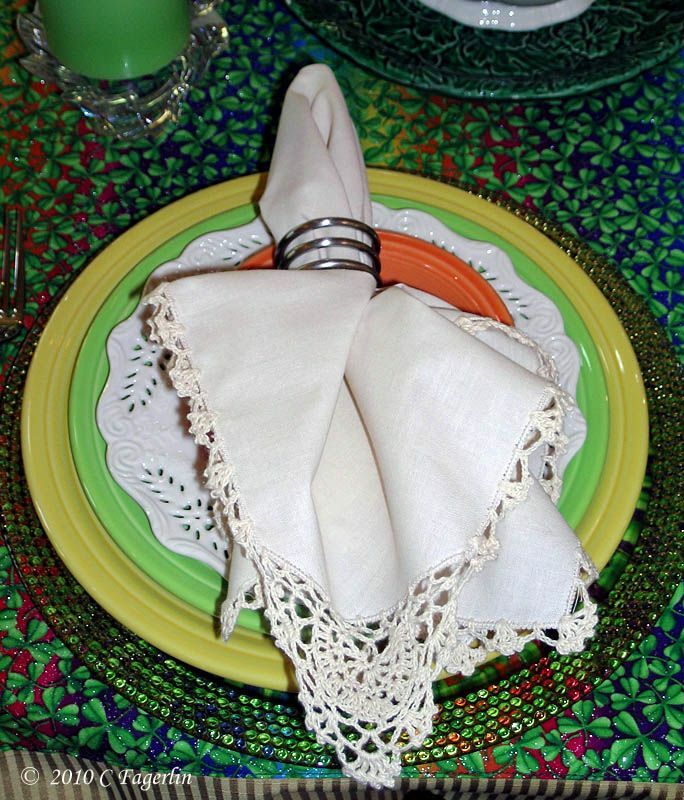 I love, love, love your napkins with the fine lace! Happy St. Patrick's Day! 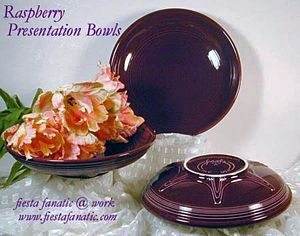 Beautiful Fiestaware and I love the bowls, too! I always look forward to seeing your table...beautiful. Oh what wonderful greenery you have at your cottage! Very Irish looking for St. Patrick's....and you even thought to add a touch of orange! 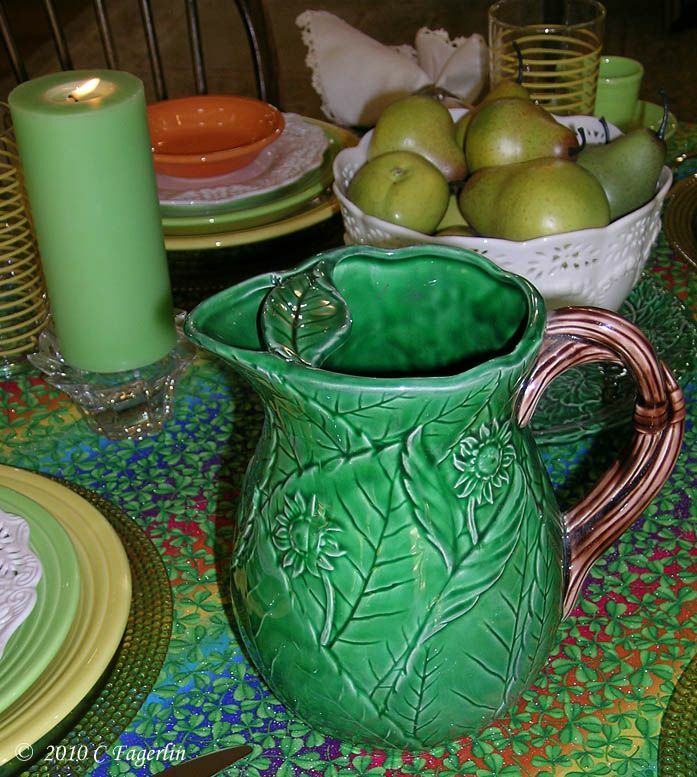 Lovely greens...perfect for St. Paddy's Day!! 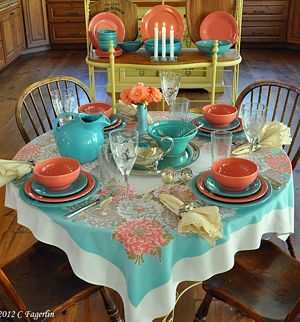 I always adore your beautiful and colorful tables and this is no exception. Just beautiful!! 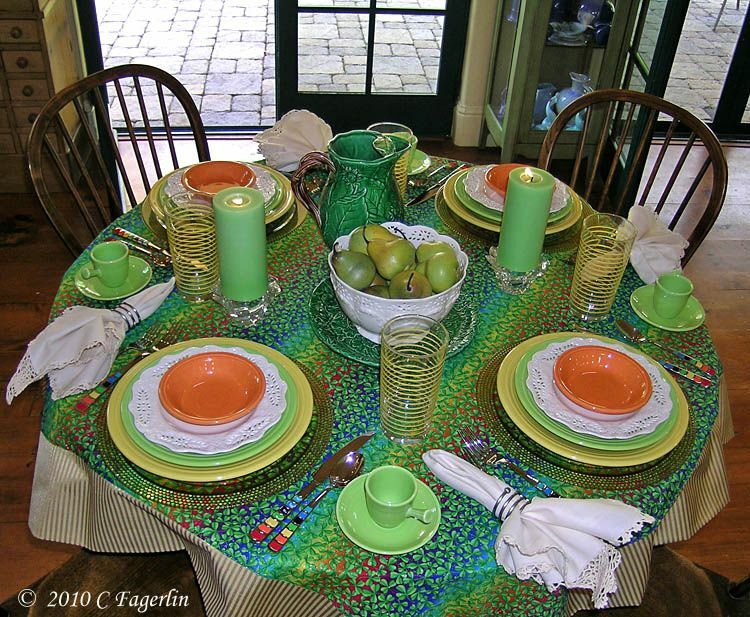 A happy , festive table anyone Irish or not would love to sit down too..
Oh, Candy, another perfect table. I'm 'green' with envy! 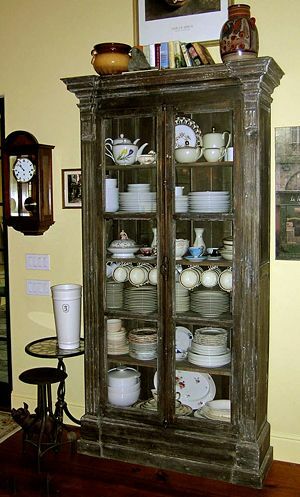 :) Your dishes are so cute and I'm in love with that great cabinet holding all of those precious vintage green bowls. Oh Wonderful! 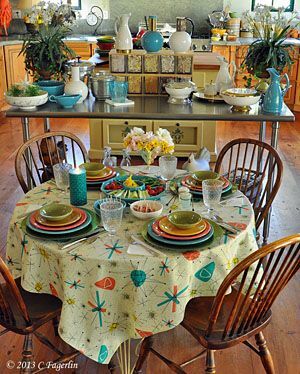 Your table is perfect and I love your mixing bowls!! Now that is a party of a table! And that bowl is wonderful..and all the other green ones too! Thank you so much for coming to the party! I love that cupboard full of green mixing bowls!!! 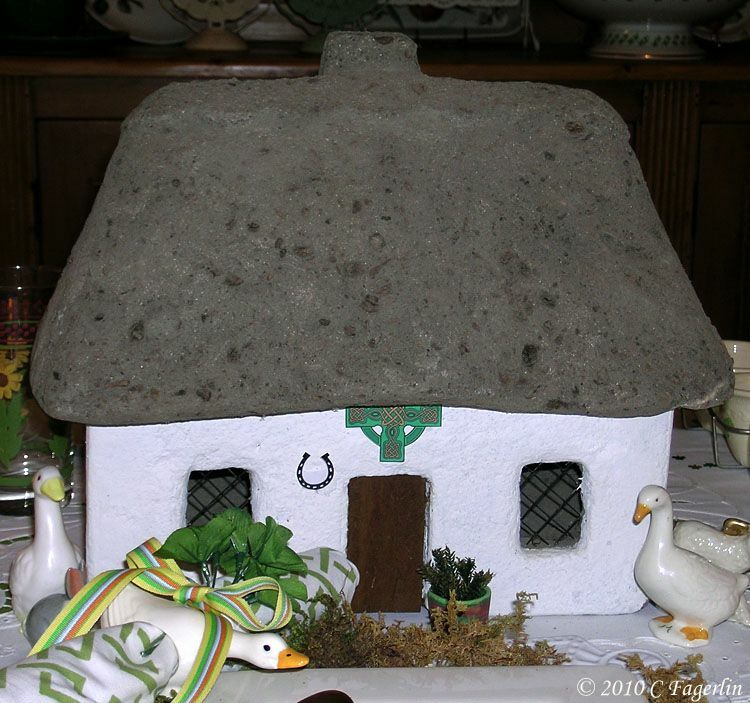 And Moira's cottage is so cute! 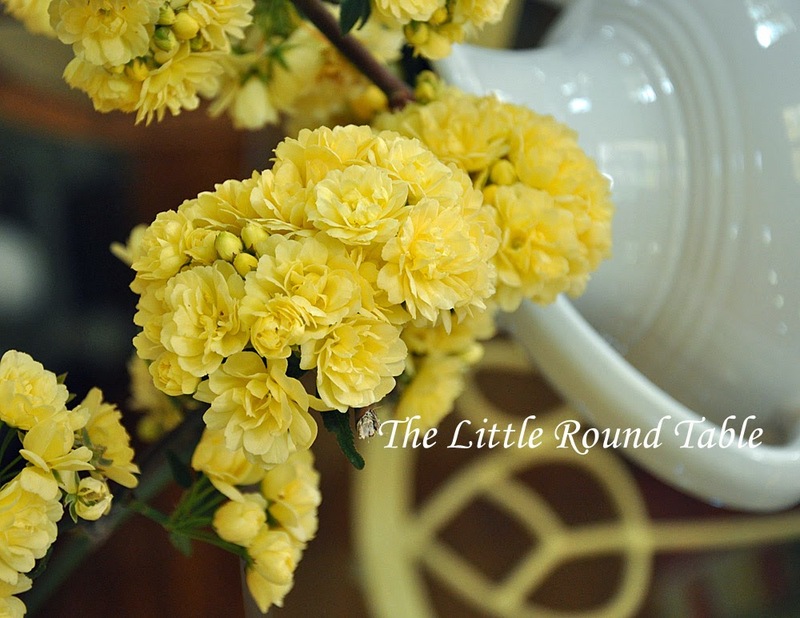 Love your tablescape...real cute dishes! 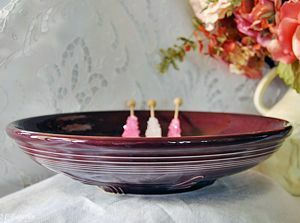 I also love the awesome vintage mixing bowls and that stunning irish punch bowl! 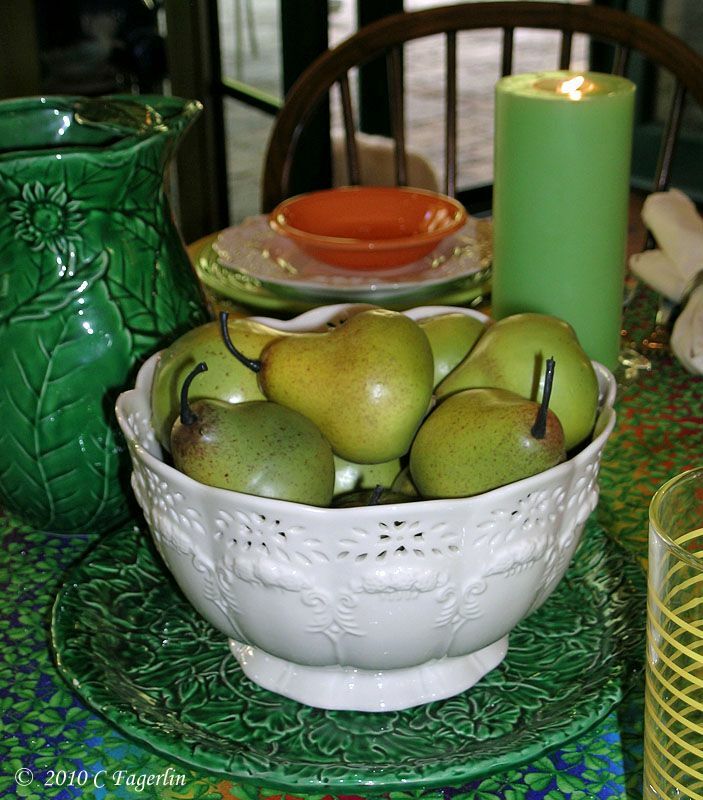 Absolutely love the vintage green mixing bowls!! 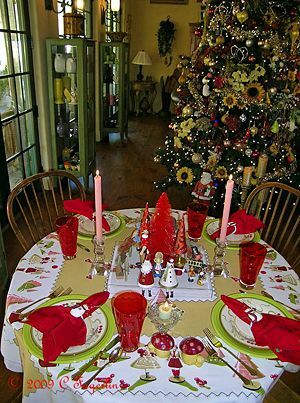 Such a festive looking table. 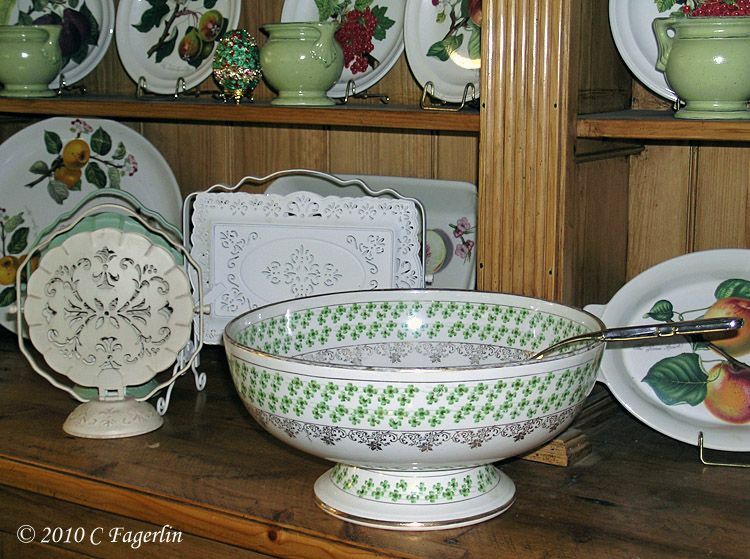 Have never seen a Shamrock punch bowl - too cute! Oh my, I'm overwhelmed by your kind remarks! Thank you all so much for coming by and commenting for St. Patrick's Day! Where did you find that punch bowl? Wow, I love all the mixing bowls. 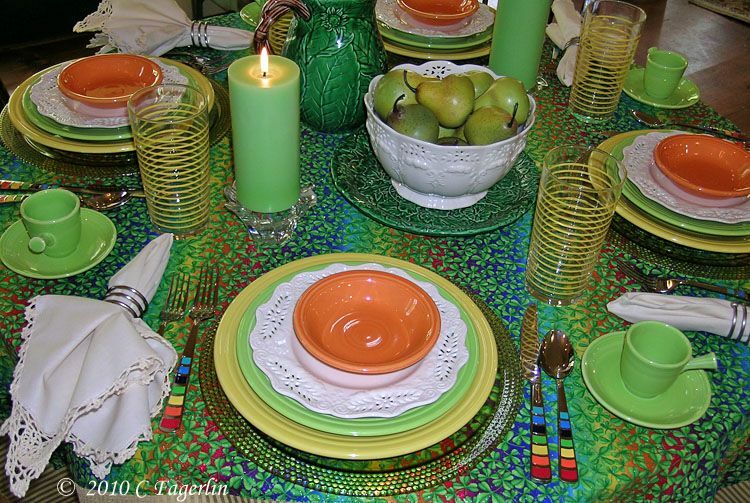 What a great tablescape and I love the splshes of golden & tangrine. 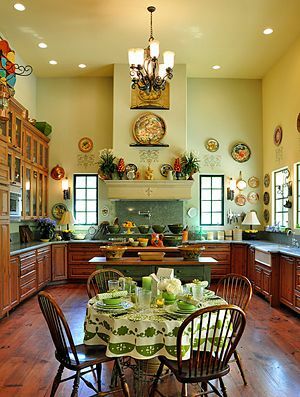 The green mixing bowls are simply gorgeous! Sparkle rainbow shamrocks...who knew? 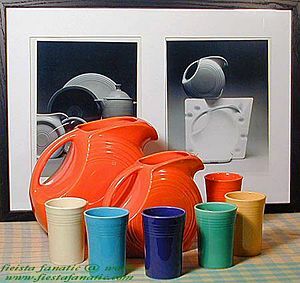 Love those striped tumblers, too! 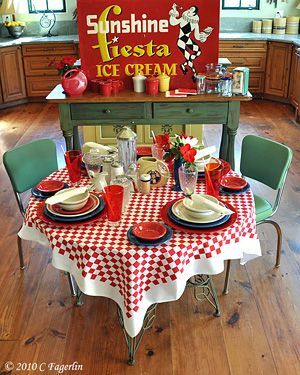 Love your Fiesta...As a recent convert to Fiesta, I'm always on the lookout for new ideas and combinations to set my table. BTW...is your chartreuse the same as lemongrass? 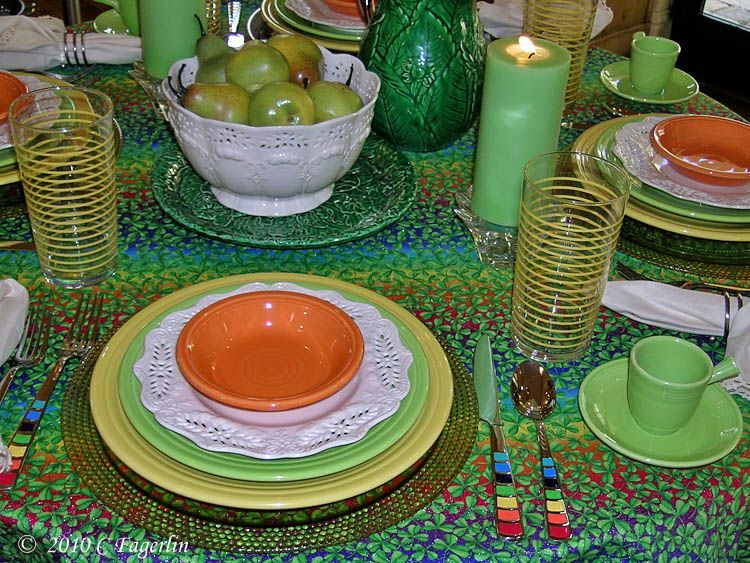 A beautiful colorful table, and love those vintage bowls - what a collection!!! Good Morning to all you GREEN lovers! Thanks for coming by to check out my St Paddy's Day things and stopping to comment. I do appreciate it! 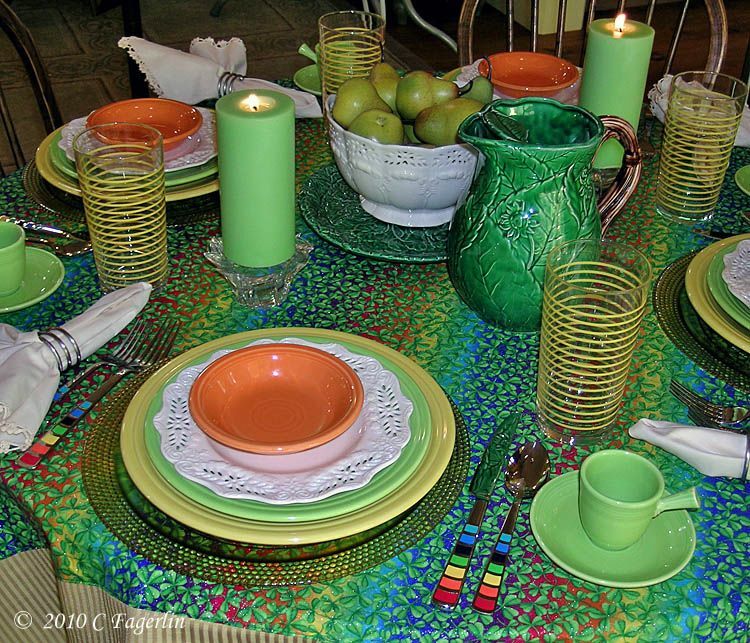 Oh, your lovely table setting looks so inviting! 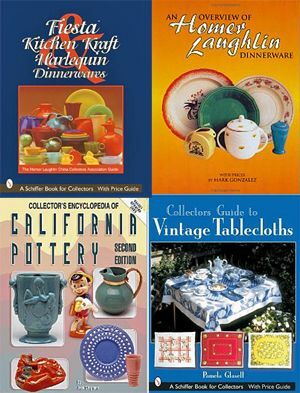 I just love the collection of mixing bowls as well. 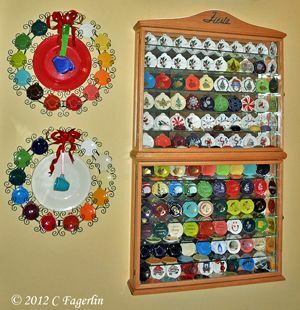 I keep thinking I might start collection bowls next...just not sure where I'll put them. Oh my what a pretty table! 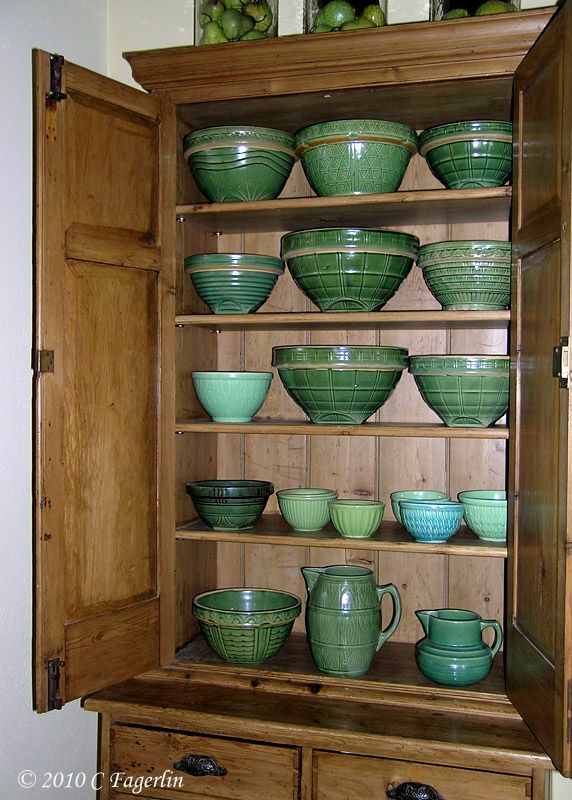 And I adore your cabinet full of green mixing bowls! 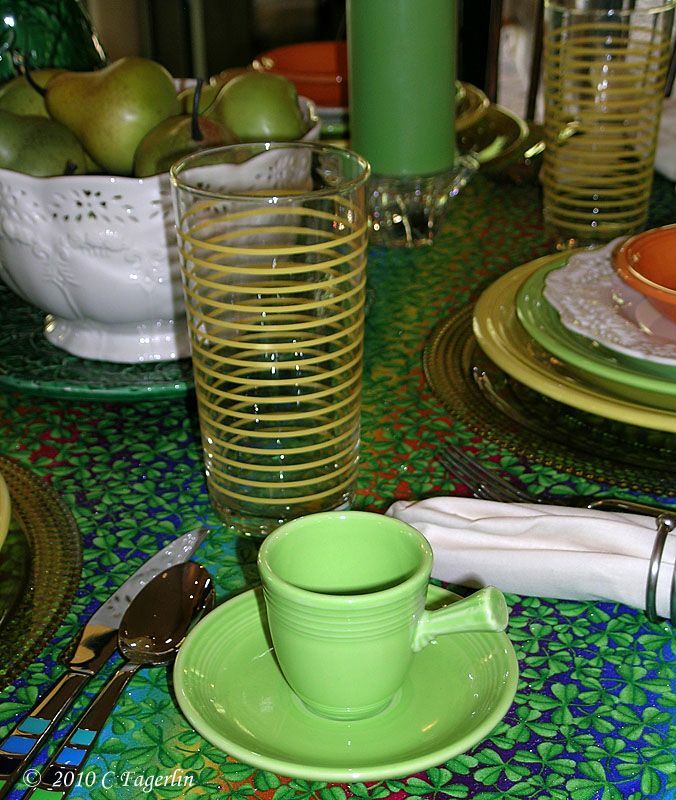 I am so happy to find someone else who collections green yellow ware! I really do know how to spell "collects". 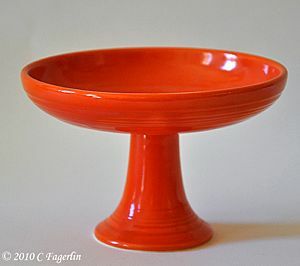 I would never have thought about orange as an accent to St. Patrick's Day, but I love it! 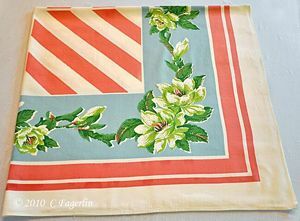 It looks so festive with your cloth. Your punchbowl is BEAUTIFUL! Thanks for sharing. Happy St. Patrick's Day! 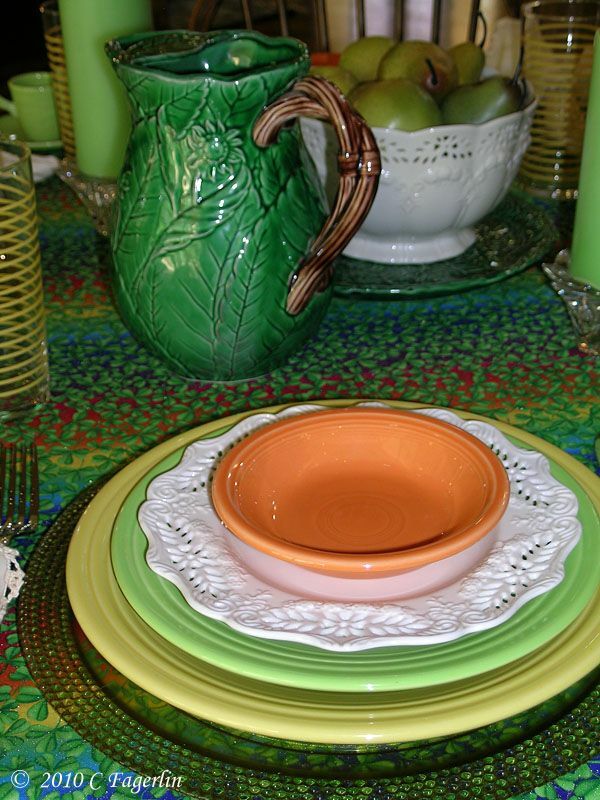 Wonderful tablescape, love your green pitcher and vintage bowls! 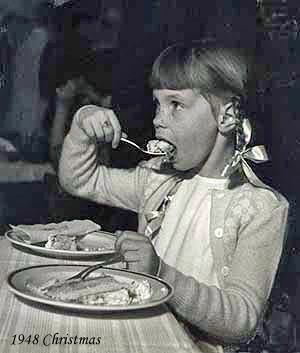 Have a wonderful St. Patty's Day! 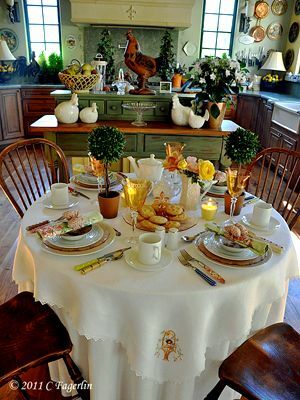 Very pretty table. I love the combined colors. Great job. I thank all of you for stopping by to see my pretties! LOL Joan - I have always thought it strange that blogger doesn't offer spell check for these comments. I rattle on and on and when the message posts I look like the world's worst speller....not far from the truth, but spell check would help! Thanks for coming by! 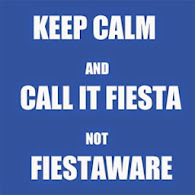 Fiesta will brighten your spirits and lift the gloom from most any day.